Salt domes are associated with oil and gas deposits in the Gulf of Mexico. They are increasingly used as impervious storage areas for dangerous chemicals. Some spent nuclear waste has been stored in these domes. 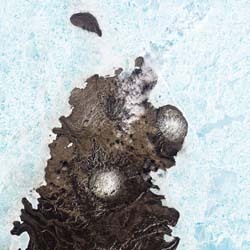 Diapirs are rock formations that develop when ancient seas evaporate leaving behind thick layers of salt deposits. Over time the salt deposits are covered with deep layers of sediment carried into the basins by river water. The salt eventually turns into solid rock that is lighter than the surrounding rock. The salt is less dense than the surrounding rock and begins to "bubble" upward breaking through weak spots in the sedimentary rocks. Salt domes are called diapirs, which comes from a Greek word meaning to pierce. Salt in a diapir is sometimes mined for table salt or used on roads to melt ice in the winter. The domes are also used as storage areas because they are almost impermeable. The salt pushing upward forms pockets between the shale rocks and the domes. Oil and gas often collects in these pockets. Oil companies drill into the pockets to obtain the petroleum used to make gasoline. A major source of the oil found in the Gulf of Mexico is in the pockets associated with salt diapirs. Ignimbrite Learn more about ignimbrite that forms during large volcanic eruptions that produce pyroclastic flows. Coal Formation Find out how leaves falling into a swamp can turn into coal. Pahoehoe-Lava Find out how pahoehoe lava forms in the Hawaiian Islands. Pyroclastic Rocks Find out how pyroclastic rocks form during volcanic eruptions. Salt Domes Learn more about how domes form, what they are used for and how they are sometimes a key to find oil.